225 Fifty Pounds Peppiatt. B244. 31st January 1938. Manchester. 94/X 14074. Very rare. About VF. 2570 Fifty Pounds Peppiatt. B244. 30th August 1934. Manchester. 76/X 17645. Very scarce. About VF. 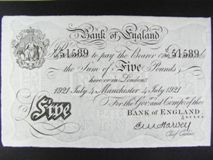 2510 Five Pounds Mahon. B215. 7th March 1927. Manchester. 326/U 37366. scarce. Small hole at centre. Near VF. 2492 Five Pounds White Harvey. B209A. Manchester. 26th August 1924. 228/U 59762. Small hole at top left, otherwise VF. 149 Five Pounds Catterns white dated 8 May 1929 serial 412/U 53382, MANCHESTER branch, creased at folds and small section missing at top right corner otherwise VF.